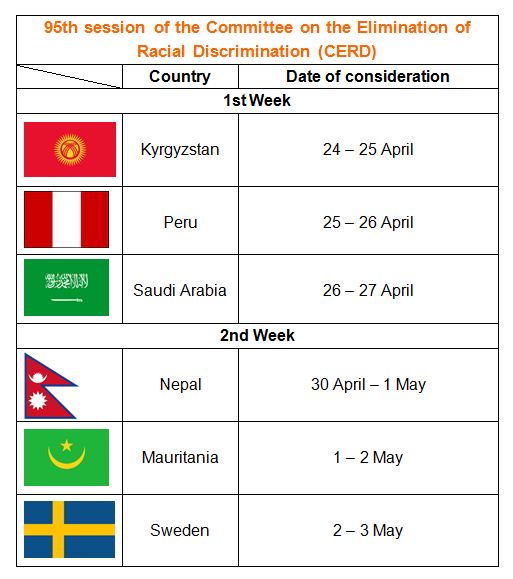 At its 95th session from 23rd April to 11th May 2018, the UN Committee on the Elimination of Racial Discrimination (CERD) will consider the situation of racial discrimination in following 6 countries. Civil society organisations (CSOs) are encouraged to submit information on Kyrgyzstan, Mauritania, Nepal, Peru, Saudi Arabia and Sweden. The Committee will adopt a list of issues prior to reporting (LOIPR) for Botswana. For States parties’ reports, list of themes and other documents, please visit the 95th session page.